Childcare Water Kit is a kit designed for monitoring and disinfecting solutions for childcare facilities. Designed specifically for North Carolina to test for chlorine - NC Daycare Test Kit. 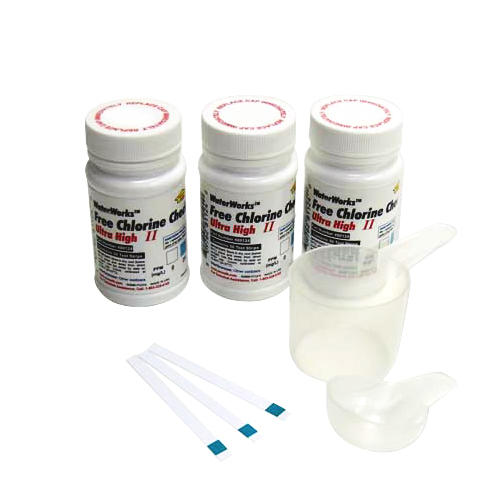 Contains 3 bottles of 50 strips, total of 150 tests. 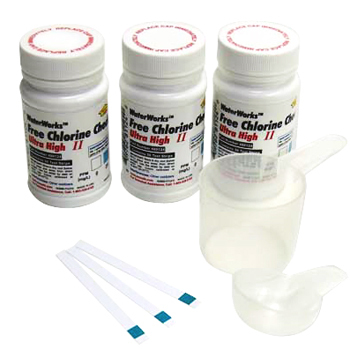 WaterWorks Free Chlorine Check Ultra High II water quality test strips have a very high range of detection with our patented Free Chlorine indicator. Designed to resist interference from monochloramines, WaterWorks Free Chlorine Check Ultra High II is perfect for determining whether or not you have the correct amount of sanitizer present. Test is designed specifically for Childcare Centers * and hospitals. Free Chlorine Check Ultra High II measures critical sanitizing ranges (from 50 - 200 ppm) and disinfecting ranges (from 500 - 800 ppm). Simply dip the test strip into your solution, remove, shake once, wait and match to the color chart. All of the reagents are impregnated on the test strip pad, and no external chemicals are needed to perform the water quality test. I run a day care center and we use this product quite often. The results are very quick and accurate. When I opened my day care I wanted to have a place where anyone would be comfortable leaving their children. Having proper sanitation is the up most important, and every parent who I work for knows my place is the cleanest. This product helps me on my mission to be the cleanest we can be, and I am very satisfied.